Taicang Zhongbo Railway Fastening is a leading manufacturer and supplier of rail fastenings in China. We are dedicated to the supply of better quality fastenings to the rail industry, as well as contributing to the availability of safer and more convenient transport. Zhongbo is ISO 9001:2008 certified through an SGS SA audit, and is also approved by the China Railway Product Testing and Certification Center (CRCC). Our products are approved by world class railroad companies, including UPRR, BNSF, SBB, SRT, PNR, and MTR. We have a professional R&D team, who work hard on the development and improvement of rail fastenings in each field. We have already been awarded 18 patents for different products, including metro railway fastening systems and tramway fastening systems. We are the rail fastening system testing base for the Southwest Transportation University, and have also cooperated with Shanghai Tongji University in their vibration reduction and wave friction reduction technology. In America, mainly in the US and Brazil, we supply E type rail fastening, W14 rail fastening systems, rail clips to metro, tramway fastenings, crane rail clips, track bolts and joint bars for rail connections, screw spikes, tie plates, and concrete ring connection bolts for tunnels. These products are according to the standards of AREMA, IFI, ASTM, and UIC, and any additional specifications from clients. For western Europe and Africa, we supply W rail fastening systems, spring blade fastening systems, KP fastening systems, metro rail fastenings, fish plates and fish plate bolts, sleeper screws, lock spikes, and spear bolts for tunnels etc. These products are manufactured to the standards of UIC, NF, DIN, and BS, as well as client specifications. In eastern Europe and middle-Asia, we supply W rail fastening systems, KP fastening systems, rail joint bars and track bolts, track spikes and tie plates to this area. We manufacture and supply according to GOST, UIC, and DIN standards and other specifications requested by clients. For the southeast Asia and Australian regions, we provide E type rail fastenings, W rail fastenings, heavy haul rail fastenings, metro rail fastenings, fishplate and bolts, track spikes, turnout accessories, and concrete ring connection bolts etc. We manufacture and supply according to BS, AS, JIS, and UIC standards, as well as specifications requested by clients. Since 2008, we have operated in the domestic market of China. We supply high-strength sleeper screws and anchor bolts for China’s high-speed railways. After six years of effort, our rail fastenings and concrete connection bolts are now widely used in the Shanghai, Shenzhen, Wuhan, Nanjing, Suzhou, Shijiazhuang, Lanzhou, Hefei, and Guangzhou metro services, as well as in another 20 cities. In 2012, we successfully developed the type WA-1 rail fastening system for tramways, and tested it at the Shanghai Tongji Transportation University. The results were fantastic, especially in the anti-loosing design field. In 2013, this type of rail fastening was used in Phrase I, and Phase II, of the Nanming River, Guiyang city project. In 2014, this type of rail fastening was used in Phase I of the Zhuhai tramway project. We are concentrating on the research and development of rail fastenings, and we are looking forward to cooperating with more technical institutes in the industry. We hope we can develop by working together, and offer safe, environmental transit to the world. This white paper includes Zhongo's various certificates and qualifications, as well as third party inspection reports and evaluations for its various products and services. Zhongbo offers HS26 / HS32 railway bolts for ribbed base plate in various dimensions under UIS864-2. The company offers clamp bolts and inserted bolts for the Russian market, clip bolts for concrete sleeper and crane rail, and bolts with British Standard Whitworth (BSW) threads. The rail clip is a boltable, adjustable, self-blocking clip with high clip strength. The adjustability is secured by means of the square taper washer. 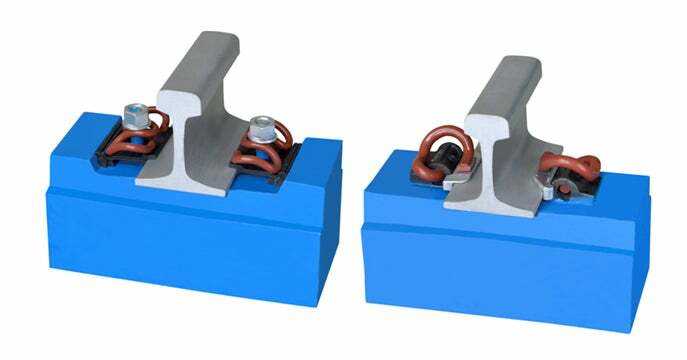 Zhongbo offers E-type rail insulators and guide plates for the SKL rail fastening and Nabla fastening systems. W14, for concrete sleepers, is the most widely applied fastening system in the world. Zhongbo have been supplying to many countries with good market feedback. The rail rests directly on the concrete sleeper, only separated by an elastic rail pad. This fastening system W14 can be adjusted in height by using height regulation plates. Regarding the tramway fastening business, Zhongbo is stronger than any other competitor in the domestic market. In the next 10 years, there are about 6,000 KM tramlines to be built in China. Zhongbo wins some tenders and we have been awarded contracts for 5 lines of tramway till the next year. An overview of Zhongbo's services and solutions. Fuzhou Metro is a new rapid rail transit system under construction in the city of Fuzhou, the capital of Fujian province, China.